1. Witty irreverent dialogue makes characters interesting. Even the unlikable ones. 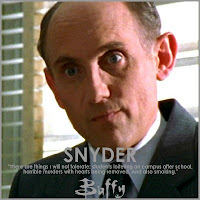 Principal Snyder is not a character you should like. He constantly causes problems for our heroine. It would be easy to cast this character as a throw away. Just a boring voice of authority. Instead, Whedon has given him some of the best lines, making him worth watching instead of a snoozefest. Principal Snyder: That's the kind of wooly-headed liberal thinking that leads to being eaten. 2. Sidekicks are almost as valuable as the protagonist. Where would the Scooby Gang be without Willow, Giles and Zander? These characters are all essential parts of story. They add meaningful support as well as comic relief. Often sidekicks are relegated to very surface personalities. It's easy to fall into the stereotype trap. The fat best friend, the nerd, the snotty cheerleader.. you name it and it's been done. They don't grow. So take it farther, make the audience care and give your sidekicks depth. Think of the growth Willow had throughout the series. And Joss Whedon did it so much better. Edward comes off as too good to be true. He has no flaws. It's obnoxious. And unrealistic. Angel is awesome because he has issues. He's not perfect, we don't always like him; but in the end, we all root for him anyway. Have you ever had a relationship that was all sunshine and roses? Where the only problems between the two of you could be worked out through a little DTR (define the relationship). Didn't think so. Buys make you cry. Love makes you cry.And sometimes... true love doesn't conquer all. Throughout the series, Buffy goes through hell. How often do we read books where the main character is never in any real peril. Nothing bad really happens to them. Buffy got the crap beat out of her on a weekly basis. She doesn't often get what she wants, but she does what is needed. Don't be afraid to hurt your hero. If there is no true peril, the story isn't interesting. And if it's obvious that the hero will come out all peachy keen... why would we keep turning the page? There are so many more lessons, but I think I'll leave it on just one final thought. Fun. In every Joss Whedon project I have ever seen, it is clear that he has fun. Look at Buffy, Firefly, Avengers... they do well and have cult followings because he has fun with his writing. When the writer has fun, the audience can't help but join in. I love this!! I was a huge Buffy and Angel fan and I definitely always loved the writing on that show. There were so many awesome one-liners it was ridiculous! And yes, it was always fun. Hehe. I love you Kasey. If I haven't told you.yet, this weeks post was awesome. Absolutely! The writing in Buffy and Angel is second to none, Joss Whedon is a genius. I've just watched all of Buffy and I'm now on season 5 of Angel. Spike gets so many wonderful lines. So true. Spike is one of my fave character transformations. Zander is my favorite. He so geekingly funny and tries so hard to be important to the group. Yet he truly matters to the story in a non super hero way. Just pure human heroism. Joss Whedon is a genius. We saw it through his screenplay for The Avengers as well, just how wonderful he is at bringing in peripheral characetrs to really mean something. Plus, my wife and I named our son (partially) after the character Xander. He did save the world with a yellow crayon, you know.